All the privacy of a deserted beach with the luxury of lush tropical décor makes this 1 bedroom, 2 bathroom Windsor Court condo a vacation escape. This 1st floor unit is just steps from the beach with a lush landscaped ocean view. New stone tile floors can be found throughout the living space. The spacious kitchen opens to the dining area with a round wood table for 4. Blue coloring and sun bleached wood decorates the living area. Plush seating faces a flat screen TV/DVD on top of an elegant wood armoire. The glass doors open to the balcony with a pool and ocean view. The master bedroom is luxurious with elegant wood and brass furnishings. The King size bed is covered in floral print gold, olive, and burnt red hues. This private suite has access to the ocean view balcony as well as a flat screen TV. The space is topped off by the private bathroom with Jacuzzi tub and walk-in shower. 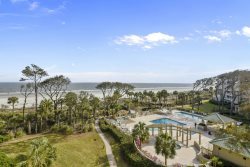 Located within Palmetto Dunes Resort, the Windsor Place/Court complex offers upscale oceanfront villas, covered parking and elevators. A private pool with a kiddie pool is heated March 15th to April 30th and October 15th to November 30th. A grilling area near the pool adds to the enjoyment of the beautifully landscaped grounds all day and into the evening. All beach distances are measured from the center of the complex. We loved the area, very convenient and the property was beautiful with all the trees and wildlife. We were very pleased with the friendliness and helpfulness of your staff. I called the last day we were there to note that the unit was lacking a colander and oven mitts, and within an hour a very friendly staff member appeared at the door with the items. Great stay. Unit had a great location and view of the ocean. Nice amenities in unit and within complex. Very nicely decorated and comfortable. Lots of free cupboard space for groceries. Nice Villa. Great ocean view. Excellent customer service, wonderful stay and experience. We were very please with everything. The vacation was wonderful. We have never used Sunset Rentals before however, we will tell all our friends about our wonderful experience. It was truly a great vacation and experience. This was my first time booking with Sunset Rentals, and throughout my entire stay on Hilton Head Island I felt very relaxed and at ease. Everything was handled professionally when I had an inquiry or concern. I will definitely use Sunset Rentals again in the future. We very much enjoy our annual vacation on Hilton Head Island, and appreciate being able to stay in the same condo. Thanks very much. The home is wonderful with all the amenities. It is conveniently located near shopping and restaurants. The ocean and pool views are outstanding, and we very much enjoyed our stay.